Learn to heal through your chakras with Kundalini yoga to bring lasting balance to your life on July 6, 13, 20 and 27 at Yoga+Express Legazpi. The chakras are energy centers that have a direct, immediate, and profound effect on our daily lives. Each chakra represents various parts of the physical body, including our emotions and our perceptions and how we project ourselves out to the world. Understanding the chakra system is a great tool through which we can gain a deeper insight into ourselves and make sense of life. 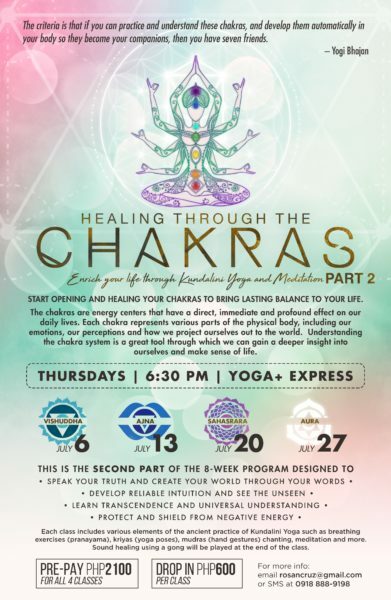 The “Healing through your Chakras” is a yoga series designed to help you understand, clear and balance each of your eight chakras. This second part focuses on each upper energy center: Vishudda to create your world through your words; Ajna to develop reliable intuition, Sahasrara to learn universal understanding and the Aura to protect and shield from negative energy. The four-week yoga series is every Thursday in July starting July 6 from 6:30 to 8:00pm and will be held at Yoga+Express Legazpi located at the 6/F Jose Cojuangco Bldg., 119 Dela Rosa St. corner Castro St., Legazpi Village, Makati. Fee is P2,100 for all four classes or drop in rate of P600 per class. For more info, text +63-918 888-9198.